Immune checkpoint inhibitors, particularly those targeting CTLA-4 and PD-1, are transforming the way cancer is treated. However, these therapies do not benefit all patients and frequently cause significant immune-related adverse events. Therefore, prognostic biomarkers that identify positively-responding patients, early in the course of therapy, are essential for guiding treatment decisions and improving patient outcomes. In this study, we present evidence that shortly after initiating combination PD-1/CTLA-4 blockade, there is a transient increase in the frequency of pro-inflammatory and cytotoxic lymphocytes in peripheral blood, and the dynamics of this shift correlate with survival outcomes in multiple murine models. Specifically, we observed that 1) the relative frequency of cytotoxic CD8 T cells among peripheral lymphocytes and 2) the pro-inflammatory capacity of peripheral lymphocytes are both predictive for outcomes at an early time point. 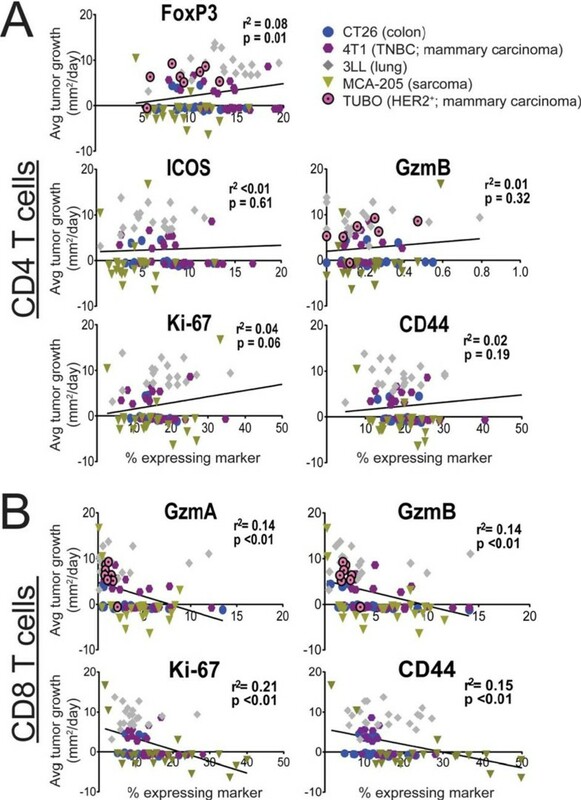 Surprisingly, robust correlations between peripheral lymphocyte markers and outcomes were limited to CD8 T cell populations. In general, the expression of potential biomarkers on peripheral CD4 T cells, including ICOS and FoxP3, were poorly correlated with outcomes in this study. Overall, these findings suggest that elements of the near-term peripheral immune response to dual anti-PD-1/anti-CTLA-4 therapy associated with cytotoxic lymphocyte function may provide unique prognostic biomarkers for therapeutic outcomes.